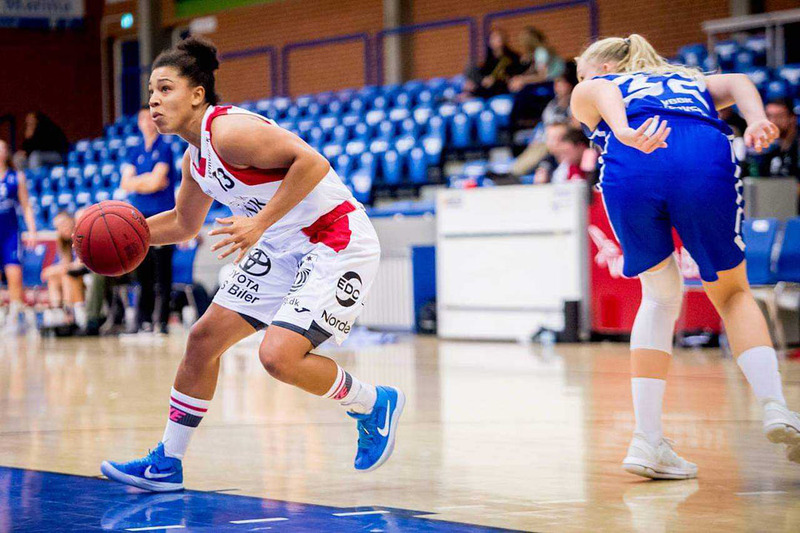 Lindsay Panchan (left) playing for Lemvig Basket in Denmark. Some could say former Durham Lords’ point guard Lindsay Panchan’s basketball career is nothing but net after signing another professional contract – in Denmark. This is the Ajax native’s second pro deal in her career. She is signed with Lemvig Basket in Lemvig, Denmark after a difficult rookie season in Germany. “It’s not a secret and I am confident enough to say I didn’t have my best year last year, so pitching me to teams this year was more difficult,” she says, adding she didn’t perform to her normal standard a year ago. Panchan was signed by the Lemvig Basket late in the pre-season. By the time she had her first practice with the team, they had already been playing for a month. Panchan began playing basketball when she was 12 and stuck with it through high school when she attended Notre Dame Catholic Secondary School in Ajax. She says she was playing for a Grade 8 team when she was only in Grade 6. She came to Durham College’s sports management program in the fall of 2014 after attending Saint Mary’s University in Halifax for two years (2011-2013). After two years on the east coast, she says she just got “fed up” with basketball and school and made the decision to take a year off. Panchan finished her time at Durham as a two-time all-Canadian, the school’s athlete of the year in 2016-2017 and broke the Lords single-game scoring record with 41 points against the Algonquin Thunder on Nov. 20, 2015.